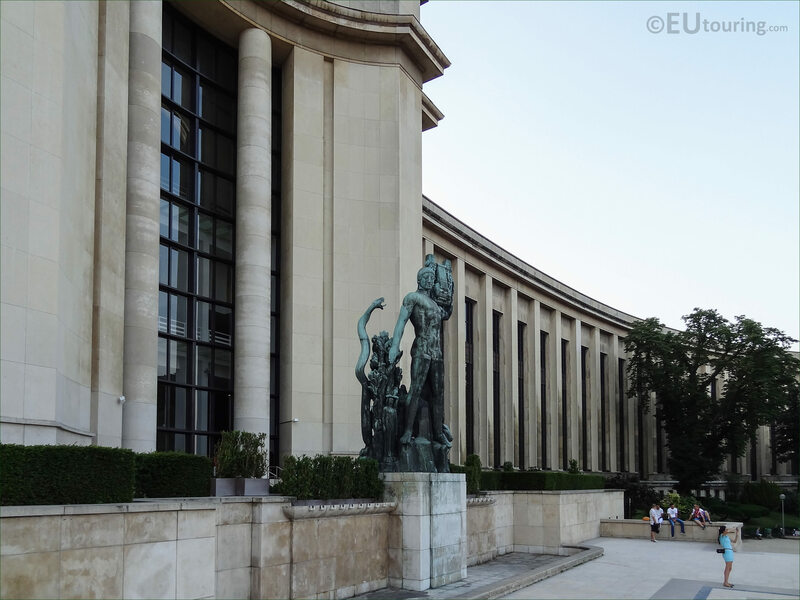 While we were in front of the Palais de Chaillot on the terrace overlooking the Jardins du Trocadero in the 16th Arrondissement of Paris, we took these high definition photos showing a statue called Apollon Musagete, or Apollo with Lyre, which was sculpted by Henri Bouchard. The Palais de Chaillot was constructed on the site of the old Palais du Trocadero for the 1937 World Fair in Paris called the Exposition Internationale des Arts et Techniques dans la Vie Moderne, and several sculptors were commissioned to produce different statues to adorn the facades, terraces and the gardens that were also renovated at the same time. So this first HD photo shows a large bronze statue that is over 6 metres in height and called Apollon Musagete, this translates in English to Apollo with Lyre, although sometimes it is just known as Apollo, which is classed as a Greek deity statue, and is one of two positioned on the terrace facing the Trocadero Gardens. 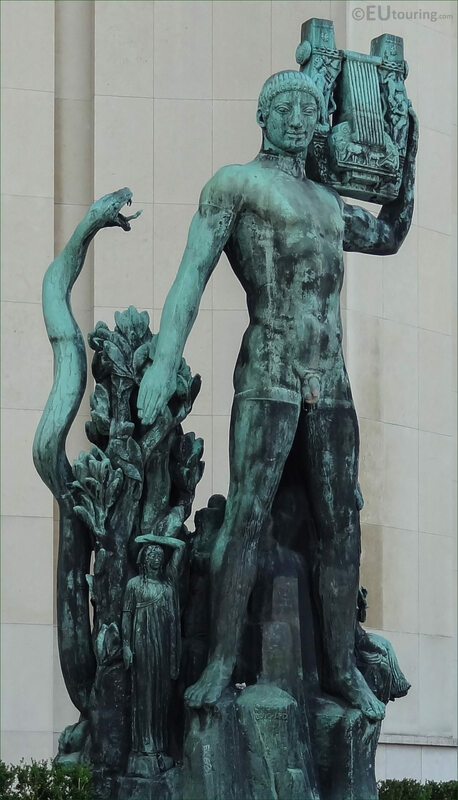 Now the above photograph shows a close up of Apollo, spelt Apollon in French, holding a lyre in his left hand balanced upon his shoulder, which is an ancient Greek musical instrument with strings, similar in style to a harp, but far smaller, and this statue, produced in bronze was sculpted by Henri Bouchard. Henri Bouchard was actually born in Dijon in 1875 and initially studied art and sculpture in his home town before going to Paris and entering the Ecole des Beau Arts, winning the Prix de Rome in 1901, which meant he could further his studies at the Villa Medici in Italy. Upon his return to Paris, Henri Bouchard received numerous public commissions for statues, monuments and sculptures, many of which can be seen in public places around Paris such as the Pantheon, Hotel de Salm, Parc Montsouris, Eglise Saint-Pierre de Chaillot, Sacre Coeur and of course this one at the Palais de Chaillot. And here you can see where the Apollon Musagete statue is located, in front of the eastern wing of the Palais de Chaillot on the terrace known as the Esplanade du Trocadero, although officially it is called the Esplanade des Droits de l'Homme, where it looks over the Jardins du Trocadero and further on, over the River Seine to the Eiffel Tower, but on the opposite side there is another imposing bronze statue of Hercules.